A group of women from one of India’s most stigmatized classes has begun operating a cafe near the Taj Mahal…and the global outpouring of support has been tremendous. Practically in the shadow of one of the most famous landmarks in India, Sheroes Hangout stands as a bright testament to the strength and courage of the brave young women who make up its staff. The pay-as-you-can cafe offers delicious snacks and beverages, and it’s run by women who are victims of acid attacks. 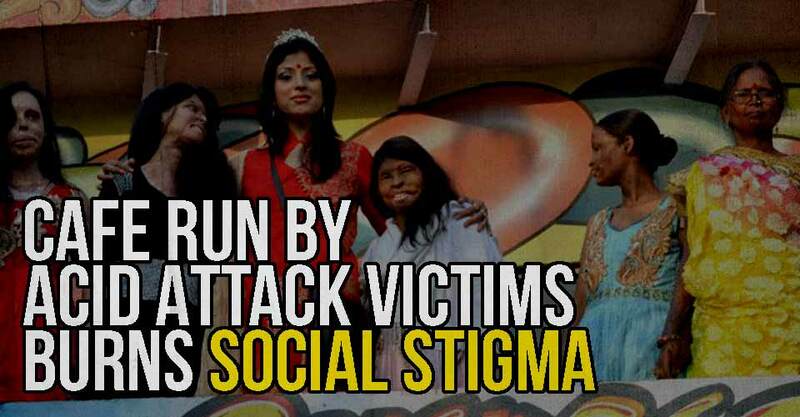 Acid attack victims are some of the most visible among trauma victims. Victims are often left severely disfigured, and their injuries include loss of sight, hearing and permanent scarring. Many victims require multiple and extensive plastic surgeries. Because acid is so cheap and readily available in developing countries -a liter of industrial-strength acid can be purchased for as little as fifty cents- it remains a common method of retaliation, especially against women. Consider the story of Geeta Mahor, whose husband poured acid on her and her children because she failed to produce a male child. Her youngest child was killed. Geeta sustained grotesque injuries; her daughter, Netu, was blinded in the attack. Stories like Geeta’s are commonplace. New reporting mechanisms in India show significant leaps in the number of attacks reported. While it is broadly considered good that more attacks are being reported, victims still have to live with life- and livelihood-threatening injuries in a society where acid attack victims are often ostracized because of their disfigurement. This is where the Hangout comes in. StopAcidAttacks.org, an NGO dedicated to helping victims of acid attacks, started the Sheroes Hangout to give acid attack victims steady work and bring them out of ostracization. The employees of Sheroes are all acid attack victims, and their stories have brought a steady flow of tourists, domestic and international, into the cafe. The cafe has also become a place where victims can discuss crimes against women in India as well as showcase their own creativity. Rupa, one of the cafe’s employees, is a tailor and fashion designer, and the Hangout is a place for her to sell her designs.